← Step Trek tickets now available online! 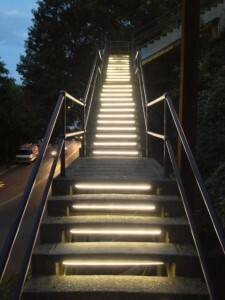 In 2012, more than 140 LED light bars, one attached under each stair tread, were installed at the 18th St. bend. Through a partnership with and funding from Duquesne Light, the stairs are now a beautiful, well-lit “gateway” to the Slopes.